Parents are tired of equal parenting bills dying and their children suffering. It seems like every week we hear about a new tragedy, another school shooting, another parent killing their children, another parent suicide, more parents becoming disabled after suffering the multi-year stress of the family court process. Extremely productive adults falling victim to PTSD and being driven out of lucrative careers as attorneys, scientists, and business owners. Parents planning for their children’s futures find their plans obstructed and destroyed by those who are appointed or employed to protect their legal rights in separation. Parents are told that the only rights they have are the ones the judge tells them that they have. Most of the time it really turns out to be that the parent being attacked or the one trying to protect their children from destructive behaviors find that the only rights they really have are the ones the chosen parent decides they have. The judge chooses one of the parents as the better parent and then grants that parent most of the privileges and benefits of parenthood, while the other parent gets stripped financially and emotionally. Both parents find themselves in a process that requires them to recruit the children to side with them, and the parents scramble to figure out how best to attack the other parent’s credibility, sometimes even resulting in the children attacking the parents and the targeted parent having to accuse the child of lying and false allegations. Parents are coming together in record numbers to protest the family court process that has developed over the years that is hurting their children, hurting them, and hurting other family members. Texas was the leader in joint custody. However, joint custody turned out to be an empty promise. Joint custody does not mean equal parenting time. There are two elements to joint custody: joint legal custody and joint physical custody. Most parents are more concerned with the physical custody aspect with their children as it physical possession of your child is how you exercise the majority of your legal rights with your child. Parents all over the United States are seeing the final and tragic culmination of the result of the violation of their civil rights and obstruction of their constitutional association with their children. The family courts are putting our nations children under stress and we have already seen more school shootings by fatherless boys, increasing teenage suicides, devastated and alienated parent suicides, increased violent crimes, and decreased productivity, increased anxiety, depression, PTSD, and declining health. This is the result of unconstitutional statutes that have promulgated throughout this country. Kash Jackson is running for Governor in Illinois and has been very vocal and active in fighting government corruption. Several other parents throughout the United States are running as political candidates to oust former Senators, house representatives, lieutenant governors, Attorney General and other politicians who have turned a deaf ear and a blind eye to the problems that these family court statutes have created in society, all throughout the United States. 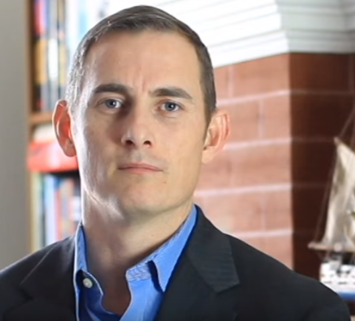 Kash Jackson, Governor Libertarian candidate for Illinois, will be speaking at the AFESP event in Washington D.C. this Sunday, May 20, 2018, between noon and 7 p.m. eastern time. This event is open to the public. Kash has been a victim of family court corruption. He is a loving father of 3 children. In March 2018 the Libertarian party selected Kash Jackson for its gubernatorial candidate. Jackson is a retired Navy veteran and father of three, who is known for his trek across the United States to reform corrupt family law practices that are harming and separating children from their parents, and causing severe parental alienation by obstructing parent-child bonds. Jackson traveled from Washington State to Washington D.C., stopping off at state courthouses and capitols to educate the public on the unconstitutional and corrupt family law practices and federal incentives (Title IV-D) driving abusive child support orders. Jackson also led the Standing Rock Indian Reservation Navy march to help the Sioux Indians protesting the government encroachment of their land to build the Dakota Access Pipeline. Kash was punished by the family courts for missing a court date to attend this protest. He has had time taken away from him with his children and he was jailed for a brief time. Kash has always been willing to pay the price for defending freedom. When he joined the Navy, he made a vow to defend the rights of this country. And since retirement he has made a vow to continue to defend the rights in this country and to help others exercise their rights that the government, including the family courts are trying to prevent him and others from exercising. Kash has already begun making plans for fixing the broken systems and “restore freedom” in Illinois. Kash has energized the political party in Illinois, and according to Julia Evelsizer of The pantagraph, “Event organizers said the convention, including fundraisers, panelist discussions and a banquet, drew the largest turnout in group history.” When Jackson smells corruption he tackles it head on. Kash knows the damage that government overreach and abuse of power has on lives. He studies the problem, looks for solutions, and mobilizes people who take action. And when one solution doesn’t work, he doesn’t give up, he will go back to the drawing table and construct another plan of action. People are moved by Kash. If you have ever met him you know the commanding presence that he has. Illinois is long overdue for a person who can lead with integrity, who understands the issues, and will not be afraid to put the people first. Kash is no stranger to gun tragedies. He lives in Illinois, a state that has suffered the most gun killings in recent times. He plans to work on lifting his state out of poverty and debt, rid the state of government waste and corruption, balance the budget, address immigration issues, improve educational opportunities, and restore hope and increase business opportunities. Kash has worked to promote personal liberty for the last twenty years and fights for the people, he is currently completing his bachelor’s degree in criminal justice so that he can continue his pursuit to restore Illinois resident’s freedom, stability and prosperity. Jackson’s party believes in fair, reasonable, and accessible government. You can listen to why Kash Jackson is running for Governor on the Greg and Dan Show where Kash talks about putting more power back into the hands of the voters. Kash says “Where we see more government we see less freedom.” His policies would lead to less family court interference into private family units. Your dreams and planned parenthood can be restored by restoring your freedom to choose how you parent in family law and integrating Troxel’s principles into every divorce and child custody suit between two parents where fit parents choose what is in the child’s best interest. Kash says that prohibition doesn’t work. Family court orders are prohibitive and restrict and strip fit and loving parents of their ability to fully parent their child. You will find healthy, well educated parents and well-off parents suffering from these injustices and unconstitutional practices, even celebrities suffer. No one is immune when the laws ignore your rights! Fatherlessness drove the first family law changes back in the early 70’s. This happened to be around the same time as the passage of no-fault divorce. And there are some parents out there who want to believe that no-fault divorce is the cause of the current abusive family court practices. This is not the case. In fact, no-fault divorce is what brought relief to those in an abusive marriage. Prior to no-fault, a person would have to prove that the person in the marriage was abusive before they could get out. The Father’s Rights Movement and the Texas Family Law Foundation (TFLF) were proponents of joint custody. TFLF has not supported any of the equal parenting bills that have been proposed over the last several legislative sessions. Professor Sampson was the only one who testified in the 90s regarding the family law statutory changes that were being made in Texas. He was very wise to testify against labeling parents as conservators. Texas however ignored this wisdom as they are today and passed this terminology into their statutes. Parents and children throughout the United States because of the way that the state statutes are worded continue to be treated like second-class citizens and losing parental authority and parental equality. Sampson explains that parents going through a divorce were considered just good enough parents who needed managing. You can read his entire paper on the history of family law in Texas here. Prior to the changes made in the 70s fathers were only getting time with their children after the dissolution of a marriage when the mother of the children decided the father could see the children. States started passing joint custody but didn’t have any parenting plan models in place, and if the final orders didn’t have specific dates and times for exchange of the child, the father again still had to beg the mother for time with his child. Most of the time this just got too stressful and too difficult on the father and the child, and the father would finally give up. Studies have been done to measure the effects of this fatherlessness and found that children were being negatively affected by the loss of their biological father. Most states today now have a default minimum parenting plan schedule to ensure that children have access to both of their parents. This unfortunately has not been the result however, and parents are being stripped of their babies with default minimum possession orders, fit parents being ordered into supervised visitation, and parents unable to enforce their parenting time when the other parent refuses to surrender the children at the ordered times leading to more and more children with separation anxiety. Claudio Sanchez on NPR said that 24.7 million kids as of last year were fatherless and did not live with their biological father in the U.S., that 7 out of 10 high school dropouts are fatherless, and that most of the educators say that the root of most of their academic problems were a lack of a relationship with their father. As the statutes have evolved to address the changing culture and changing needs of parents and their children, the broken system continues and unsuspecting parents who think that they will walk in to the court, be represented, and get justice find out too late that the states continue to take advantage of fit parents and their love for their children by using this love to extort the parents and put them through an unnecessary expensive and punishing and torturous child custody litigation battle during a time when the parents are at odds and going through a difficult time of separation and restructuring of their family unit. Many parents describe this process as the worst hell imaginable, worse than any horror film in Hollywood. Some parents say they would rather spend years in prison than lose contact with their children. Fathers who do want a relationship and to spend time with their children quickly discover that rather than protecting the parents and children the family courts impose a destructive requirement for the parents to become adversaries in a battle royale. All of the planning that each parent made for parent hood goes out the window and the courts fracture family bonds and some parents and children suffer family bond obstruction so severe that some never recover from them, fall into depression, end their own life, and sometimes end the life of others as well. Yesterday, a father shot his ex-wife and their three children and her boyfriend in a home in Ponder, Texas. The mother is the only survivor. Today, there is another school shooting in Santa Fe, Texas, just south of Houston. One has to wonder how much longer it will take for CNN and other media outlets covering these shootings to understand that the true root of these problems is the fear driven family court process. The lawyers and judges escalate the already stressed parents going through separation and make them think that if they do not destroy the other person’s character they will lose their children. These parents were going through divorce in Tarrant county. The custody of their children would have always been under the control of the Tarrant County judge and dependent on standards that change according to the judge’s personal bias and preferences, under what is called best interest of the child. Some judges in Texas will use what is called Holley factors. These are just a bunch of subjective categories that open the parent’s private lives up to scrutiny and invasion into their personal parental choices. Those that do not understand how this works have a false sense of security and believe that these Holley factors protect the children. They are wrong. They just make the parents believe that they have hope of winning child custody from the other parent if they can convince the judge they are the better parent. Problem is the parents don’t really know what the judge is looking for and it costs a lot of money to do the discovery and to provide evidence to the judge to prove that you are the better parent. And even then that is not a guarantee that you will win child custody. That just buys you a ticket to keep the litigation going. Ron and Sherry Palmer went through it and have been teaching parents and attorneys a better way to do this for less money, less stress, and fewer delays using legal rights of separated parents according to the constitution, because when parental rights are protected children are better protected, and everyone is better off. Ron and Sherry believe that the children and parents who are forced into this high conflict adversarial system have an increase in violent crime being expressed through their children and the distressed parents are at a higher risk of becoming violent or becoming a victim of domestic violence escalated by the unconstitutional practices of the family courts. Media can contact Ron and Sherry Palmer here. Years back a boy named Nathan Grieco committed suicide after leaving a note complaining that one of the stressful events in his life that pushed him over the edge was the divorce of his parents. The father in that case complained about parental alienation. The mother complained that the children were not allowed to make their own decisions to not go see their father. We find that the issues become more and more polarized by people in family law looking to use the angst of the parents and the children to push their own bias and prejudices and fears onto others. Rather than just protect freedom and accept that there will be people who make parenting choices that you might not like but that the children have a right to, they try to micromanage the parents through the process and the judges try to play super-parent, resulting in irreparable damage and destruction, that we see resulting in increased suicides, increased violent crime related to domestic violence (domestic violence we feel many times is escalated and triggered by the fear of the process), anxiety, depression, lead to more drinking and teen pregnancy, and increased teen dropout rates. You can read more of the statistics here. Bad laws create bad results. The Father’s Rights Movement was able to get legislators to eventually pass joint custody in the mid 70’s but that wasn’t enough. 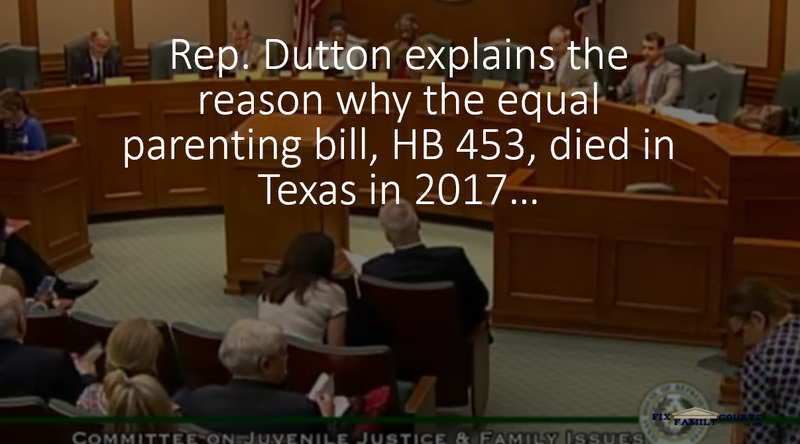 Another round of pressure put on the legislators by father’s rights groups in the 90s resulted in a standard possession order being passed in Texas as the default when the mother and father were in disagreement about the parenting time. Other states have mirrored this model. The culture has changed again and the social cost of fatherlessness and the importance of fathers getting more involved in the parenting of their children has prompted legislators to answer the renewed father’s rights pressure for equal parenting time. Kentucky is the first state to pass the equal parenting time statute in their temporary orders last year in 2017, followed up with an equal parenting time statute for final orders and for modifications of child custody passed this year, 2018. Parents that are stripped from their children suffer parental alienation and are unable to be there for their children. Children being bullied lose the support system that they had in both of their parents when they are victims of alienating tactics. The Florida shooter, Nikolas Cruz, was bullied and so was the most recent shooter this morning in Texas. 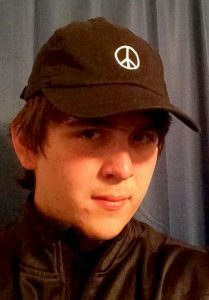 This shooting was carried out by another teenager, Dimitrios Pagourtzis said to be bullied in high school. I would like to point out that this is not just fathers being stripped from children. Mothers too are being stripped from their children, and since the removal the tender years doctrine and the primary focus being on the best interest of the child standard, more and more mothers are finding themselves erased from their children’s lives as well. Children depend on the security and stability of their parents and when the state statutes encourage and drive adversarial litigation, everyone suffers. Lilia Luciano of ABC news has been running a series of reports on the family courts in Northern California. She began this series with an introduction to parental alienation the day before Bubbles of Love Day on April 24, 2018. There have been some reports that ABC has wanted to bury some of her stories from the research that she has done over the last two years, so Lilia started doing Facebook live videos to get the story out. She has identified that parents are pushing for more transparency in these courts and for judicial oversight. Some parents were being stripped of their rights to their children by CPS and others by the other angry parent with the help of their attorneys and the judge, magistrate, or commissioner overseeing their child custody case. Some of these parents are losing their children based on nothing more than the personal bias of a parenting facilitator, a guardian ad litem or an amicus report or through a 730 evaluation. Lillia talks about the power of the judge, and discusses some parents using their money to influence the outcome. The more money the parents have the more burdens the family court imposes on the parents and the longer they are in court. Lilia says “That’s why parents and advocates for court reform have taken this fight to the legislature. In 2016, they got the state to audit the Commission on Judicial Performance for the first time in its almost 58 year history.” And parents throughout the United States are continuing this trend. Ron and Sherry Palmer’s concern is that after you get the oversight where will you take it. They hear a lot of parents still getting their legal rights wrong and that will just allow the abuse to continue just under a different name. As you heard in Lillia’s video above shows that parents are told that they just need more evidence. This is not enough to protect yourself from losing custody in these family courts. Parents are victimizable and are told far too many things that even advocates that parents find along the way can get bad information, partial information, or simply get information overload. Ron and Sherry have an online course that helps parents understand how to change the process and use their rights to protect themselves and their children and win child custody protections that they otherwise were not getting. The process takes longer than it should because parents are not putting enough pressure on the courts themselves. The laws need to change. AFESP has coordinated a summit where many of the parental rights political candidates are coming together to educate other parental rights advocates in the communities so that they can get a rebuttable presumption of equal parenting time statutes passed in their states. They hope that this will result in the end to fatherlessness that they believe is being driven by the current false promise of joint custody. The speakers hope that they can convince all of the states that equal shared parenting is good for our children and good for society. Go here to see the speaker lineup. Even if you cannot go to this event, please consider a donation to help fund their continued efforts to change the laws on your behalf and your children. If you are a parent going through the family court process, we encourage you to learn the legal rights of separated parents that attorneys are not telling you about from our books here. You can also become a member and read our books online immediately here. If you are going to work on changing the laws and want to know how to make them constitutional, read the books, get into the membership site and get access to even more information. Learn these rights for yourself, do not just buy into someone else telling you what you do or don’t have. Find out what you and your child are entitled too. Your future and your child’s future depend on you learning your rights and using them! Become a member here today and get on the road to freedom! Ginger Gentile will be in Washington D.C. to show clips of the new documentary Erasing Family in June 2018 at the AFCC conference. You can get more information about her travel schedule and how you can connect with her to help her fund the Erasing Family project here.